There are many wonderful cookbooks out there that are not focused on gluten free cooking but often have many naturally gluten free recipes. Even if they are not, you can easily convert most of them. Mobile & iPad users click here. Of course when it comes to gluten free comfort food, you don’t want to forget my cookbook. 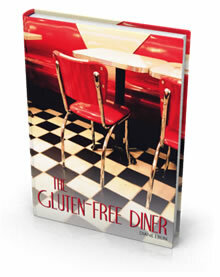 Inside The Gluten-Free Diner you will find 48 diner-inspired recipes for everything from bacon and eggs to chocolate sorbet. These are my original recipes that I have served to family and friends so they’ve been road tested. They were created to be gluten and dairy free and full of flavor. You will also find an index based on ingredients and my Gluten-Free Diner menu. This will give you ideas on how to take the recipes in this cookbook and make them into so many meal combinations that you may not ever get tired of them. Now available in EPub format for your Kindle or iPad! Not only does this book provide you with great inspiration to help increase your intake of great healthy produce, but it also benefits others. 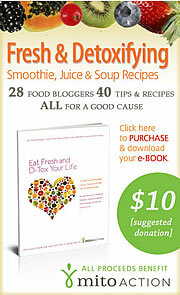 Proceeds from the sale of this e-book go to MitoAction. There has been much written about food beyond cookbooks. There are books that talk about where food comes from and how it’s processed in today’s world. Arm yourself with knowledge. Mobile & iPad users click here. There is more to life than just the food you eat. There is what Integrative Nutrition calls Primary Foods. These are things that contribute to our nourishment and fulfillment through healthy relationships, regular activity, a fulfilling career and spiritual awareness. Here are some books I like in the Primary Foods department. Mobile & iPad users click here. The Whole Truth reveals which type of foods and activities are best to help you reach your ideal weight, increase energy, and disease-proof your body. This inspirational book will give you practical tools you can use every day to improve your overall health, and look and feel your absolute best. Order now and reclaim your health today!